In Daily Paragraph Practice, students focus on one weekly topic and write a daily paragraph using one of the four prompts. Each prompt represents a different type of writing--descriptive, persuasive, narrative, and expository--and is designed for upper elementary and middle school students. 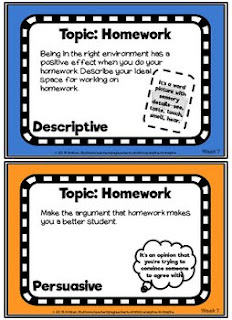 Taken from the full resource Daily Paragraph Practice, this freebie provides a sample of the weekly topic and its four related CCSS-aligned writing prompts as well corresponding graphic organizers and paragraph copy templates. See below or click here for a description of the full, paid Daily Paragraph Practice activity! With 40 weekly topics--each with a descriptive, persuasive, narrative, and expository writing prompt--students will cover a wide variety of high-interest, cross-curricular, kid-friendly subjects and writing purposes for an entire year! The daily writing prompts are student-centered and emphasize students’ own experiences and knowledge. It’s a great way to get to know students throughout the year! In addition, prompts are aligned with Common Core Writing and Language Standards. Many topics/prompts can also be extended into longer writing assignments and/or research projects. Use as many or as few topics and prompts as fits your instructional needs. Assess as many or as few paragraphs as you need to evaluate student progress. This activity can be adapted for use with an entire class, small groups, or individually.